Country Kids Organic Cotton Girls Footless Tights - Size 1-3 Yrs. 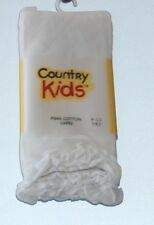 Country Kids Ribbed Cotton Girls Tights - Size 1-3 Yrs. Country Kids Organic Cotton Girls Footless Tights - Size 6-8 Yrs. Country Kids Girls' Nautical Capri 2 Pair. Contemporary nautical stripe design. Size: Big Girls 9-11. Country Kids. Machine Wash. Easy care, machine washable. 10x8x1, 00.07Lbs. Country Kids Whimsey Girls Tights - Size 3-5 Yrs. Country Kids Heather Winter Girls Tights - Size 1-3 Yrs. Country Kids Fuzzy Dots Girls Tights - Size 1-3 Yrs. 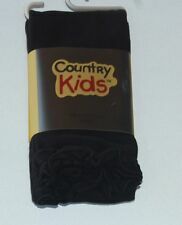 Country Kids Big Color Girls Tights - Size 1-3 Yrs. 50% Pima Cotton, 45% Nylon, 5% Spandex. Sensationally soft pima cotton makes these tights soft and comfy. It's that simple and will save you a bundle! Local Pick-Up: Local Pick-Up is FREE! If you let us know when you are stopping by, we will have your order pulled and ready for you. Country Kids Big Random Dot Girls Tights - Size 9-11 Yrs. Country Kids Girl's 6-Pairs Striped Turncuff Quarter Crew Socks. Model: Striped Turncuff Quarter Crew 6 Pk; 415. Quality & choice have been their watchwords from the beginning. Country Kids now supplies a complete range of children's tights & socks. Country Kids Girl's 6-Pairs Flutterby Crew Socks. Model: Flutterby Crew 6 Pk; 492. Crew Style Socks. Quality & choice have been their watchwords from the beginning. Country Kids now supplies a complete range of children's tights & socks. 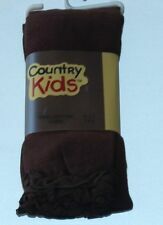 COUNTRY KIDS Organic Cotton Sport Socks Ped Liner Handlinked Age 1-Adult COLORS!